Deal with it very well. LOVE THE MINI MAX!!! RECOMMENDED HOLIDAY GIFT. I bought the mini max because my car engine had occasional starting problems. I never expected the mini max to work as well and quickly as it did when my car needed a jump start while at the gas station. My engine is 3.5 liters. I didn't think the little gadget would have enough power to jump start my car. All I did was plug the fully charged gadget to the negative and positive, then started my car. Right away without any hesitation the car engine started and I was on my way. Very impressed with the mini max. Made for the independent on the go person. Happy Holidays! Only good for charging phone. Tried jumpstart 3 cars with dead battery didn't work as soon as I tried the charge bars dropped to 1. 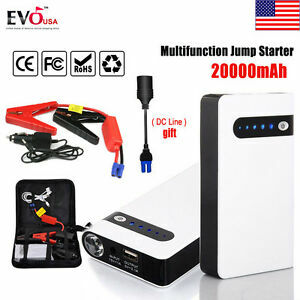 But it charges phone well just not good for jumpstarting car. I used this product over the weekend. My car battery died and my car was towed by a towing company. The guy from the towing company offered to jump start my car but I told him that I bought Minimax and I wanted to try if it works. He was helping me to set up the Minimax. The first time we tried was unsuccessful. Turns out that he did not turn on Minimax! The second time we tried and my car started immediately! I was worried in the beginning since it is winter time now and it might be too cold. In addition, my car is really old (1996 Toyota). I am very happy that I invested $39 dollars and I will not worry about my car not starting in the future!